Most Floridians already know about the loss and degradation of our coastal habitats. One of the major causes of coastal habitat loss is shoreline armoring. 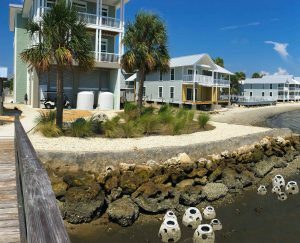 Shoreline armoring, or hardening, occurs when seawalls, bulkheads, and large rocks (called “rip-rap”) are placed along shorelines. Shoreline armoring, though necessary in some settings, is harmful because it creates an abrupt transition from land to sea. The natural condition of most shorelines in Florida would be a shallow slope. The gentle gradient from the sea to land allows the tide to move in and out of a narrow strip of shoreline. This is called the intertidal zone and is where valuable plant and animal life thrives. So, we miss out on a lot of benefits when we compromise the intertidal zone through shoreline armoring. Furthermore, shoreline armoring has a whole slew of other negative consequences such as high cost and harmful effects to adjacent properties. A recent study showed that about 14% of the shoreline in the US is armored . In Florida, over 50% of the shoreline is armored in some counties. Even though seawalls will eventually fail, it is unlikely that many home or business owners who currently have seawalls would want to remove them while they are still functional. So, what can be done to reclaim at least some of the shoreline benefits lost to all this armoring? One option is to enhance oyster, marsh, and/or mangrove habitat in front of the seawall. 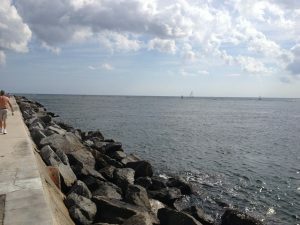 This so-called “seawall redemption” can have many benefits such as providing habitat, protecting the seawall, increasing the beauty of the site, and capturing pollutants contained in runoff. Redeeming a seawall in this way is not habitat restoration because several shoreline functions are still lost. However, a redeemed seawall is often a vast improvement over the hard, flat surface of a seawall alone. In fact, A redeemed seawall is a type of living shoreline (for more about living shorelines see: www.flseagrant.org/florida-living-shorelines/). Home and business owners have many options if they want to redeem their seawall. Check out floridalivingshorelines.com for some great project ideas. The Florida Department of Environmental Protection allows small-scale shoreline projects that meet certain criteria to move ahead without a permit (see: http://edis.ifas.ufl.edu/sg155). Likewise, the US Army Corps of Engineers offers either permit exemptions or fast-track permits for small scale shoreline enhancement projects. Therefore, you could be up and moving on your seawall redemption in fairly short order! There are a growing number of professional contractors that offer shoreline habitat services. 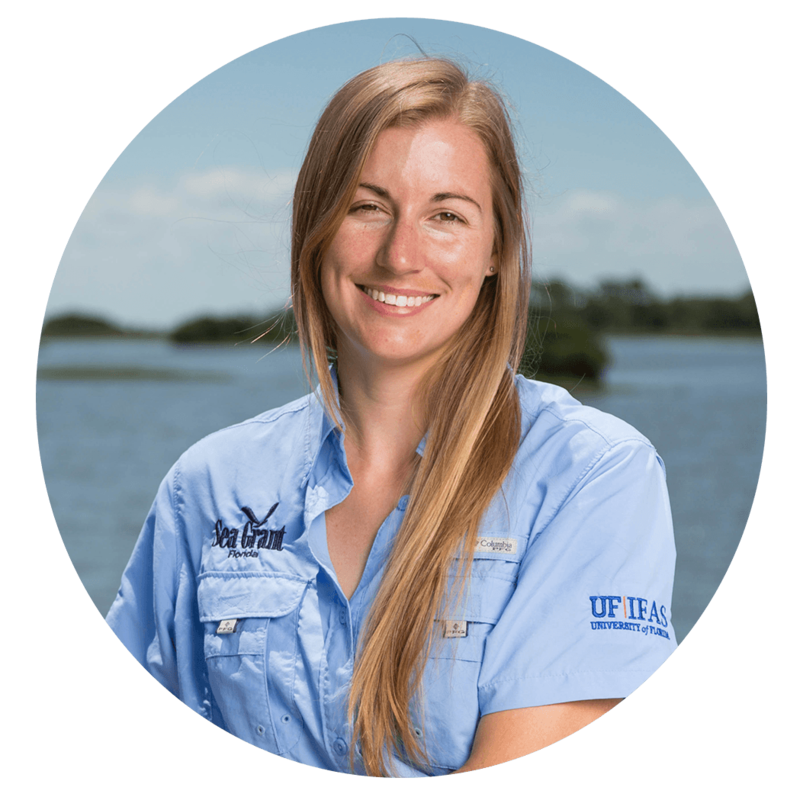 Thanks to a course in development by the Florida Fish and Wildlife Conservation Commission and their partners, there will soon be more marine contractors offering these services. 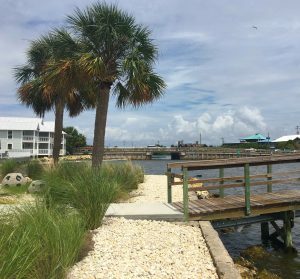 My office is located in the UF/IFAS Nature Coast Biological Station in Cedar Key, FL and we have (yes) a seawall on the property. The lot was developed in the 1950s, well before society understood the negative impacts of seawalls. The seawall caused loss of shoreline habitat and did little to absorb wave energy. The previous landowners maintained a grassy lawn that required fertilizer and water, increasing freshwater use and the risk for fertilizer to run off into the neighboring Gulf of Mexico – not good! Recently, we embarked on a mission to improve upland management practices and redeem our seawall. Our goals were to improve habitat, reduce nutrient runoff, conserve freshwater, and increase water filtration by oysters around our property. First, we installed low-maintenance native plants and “rock-scapes” following the Florida Friendly Landscaping guidelines. Our landscape includes a 10-ft buffer zone next to the water. We do not apply any herbicides, pesticides, fertilizer, or water anywhere on the property. Next, we increased the habitat complexity in front of the seawall. 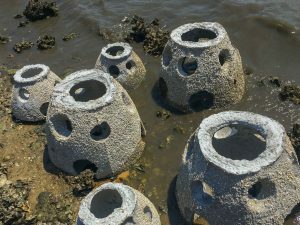 We did this by adding limerock boulders and a row of oyster recruitment domes (commonly called “reef balls”). As oysters recruit to the domes, the habitat complexity will increase and, hopefully, so will the use of the habitat by birds, fish, and invertebrates. 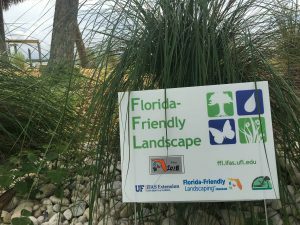 We are happy to report that our landscape is certified as a silver level Florida Friendly Landscape! We will be monitoring the success of oyster recruitment onto the domes quarterly for the next three years. 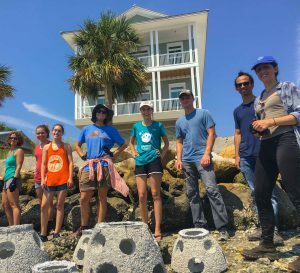 Stay tuned for updates and feel free to stop by the Nature Coast Biological Station around low tide to have a look for yourself! Feel free to get in touch if you want to learn more (savanna.barry @ ufl . edu).